An easy approach to the perfect Magic Square. This is a completely new, and easier method for compiling a 4x4 (16 cell) Magic square that totals to any number called by the audience in 52 different ways. The original method from which this has evolved was first published in 1993. You can master this with just a few trials in less than an hour, and use it for a lifetime - with nothing to buy, nothing to replace! With most magic square effects the method has two components. One component is memorization, the other calculation. For example, you memorize one particular magic square and then with appropriate calculations you can modify the memorized square to achieve other sums. 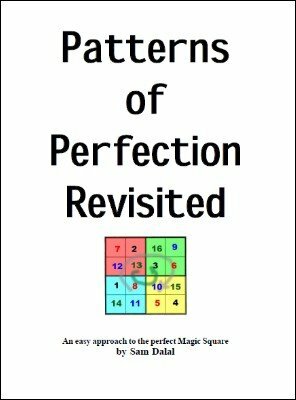 What Sam Dalal has created here with his Patterns of Perfection Revisited method is to significantly improve the memorization part. He has made the memorization so easy that it is hard to forget. I read the method once and I think I will never again forget it. It is that good. He also offers a number of other hints and tips on the calculation part. 1st edition 2011; 20 pages.